DecisionPath truly added value for our division and educated those who were involved. As business intelligence consultants, we understand that there are a number of ways for us to share information. Below, we’ve included a handful of the business intelligence videos we’ve created. Some are more lighthearted than others, but all are intended to provide both technical teams and business users some insight into the benefits and uses of business intelligence and discuss current issues companies are facing around BI. Please feel free to watch, share and comment. The possible future of executive decision-making? A lighthearted look at intuition vs. data driven decisionmaking. Nancy Williams, VP of Business Intelligence and Data Warehousing, discusses how much a part of the mainstream business intelligence has become, and how far it has to go. 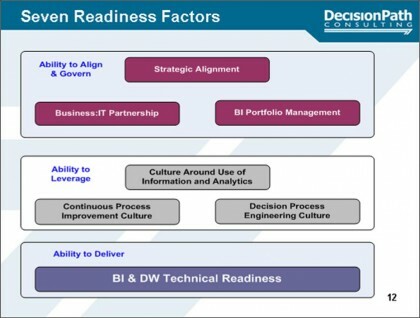 A brief description by Steve Williams, President, of how the terms business intelligence and business analytics are related. If you’d like to see the complete set of DecisionPath’s videos, please visit the DecisionPath channel on YouTube.